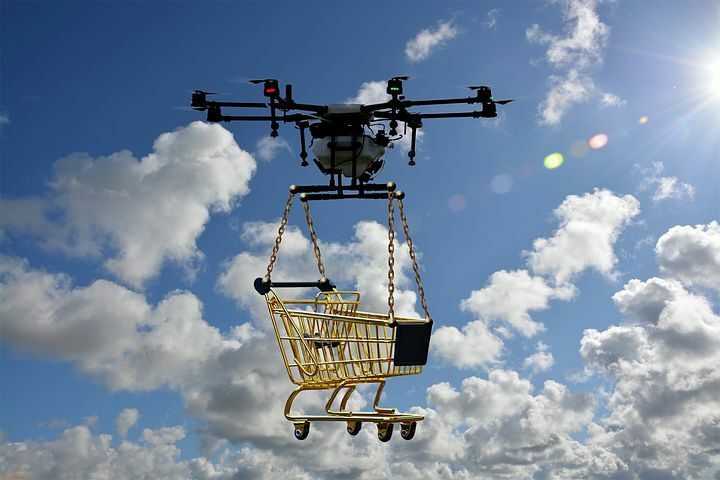 When you think of Amazon.com you might think of all the items you’ve ordered using your Prime membership with fast 2-day delivery and the likeliness that soon your orders would be dropped off by drones like the one in the picture above. But when I hear Amazon, I almost always assume people are talking about Camperforce, the seasonal workforce of RVers they hire season after season to help fill holiday orders in record time! Working for the online super giant is truly an experience that’s hard to put into words. There are so many pieces to the story that need to be told and there is usually very little time to tell it. To be honest, working at Amazon can best be described as working for a well-oiled machine. I know that sounds cliché, but it’s true. Everything from the moment you step inside the building is planned, timed, scheduled, organized and then constantly being tracked, measured and observed for ways to make it better and more efficient. Working in one of their fulfillment centers, inside the Camperforce program, means working for one of the largest, if not the largest, online retailer in the World. You’re on the inside and you’ll soon see first-hand what happens after a customer makes a purchase from their computer screen. You’re working day in and day out to fill orders not only for customers but most likely for your family members as well. Time is everything and your ‘numbers’ will show how your performance rates against the typical Amazon employee. A typical day depends on which department you’re working in, the number of orders to be filled and what shift you’re working on. Generally, you’ll clock in after entering the building and dropping off personal items in your locker. Clocking in for the day is a sight to see! Employees line up at every time clock and wait patiently for the exact second when their shift begins. Then one by one they scan their badges and proceed to their start areas. After arriving at your start-up area you will meet with your department heads at a start-up meeting, where basic stretching is completed while important information is relayed through your Manager. After setting off to your station, or if you’re a Picker– wherever your scanner directs you, your day will progress until either a scheduled break, lunch or the end of your shift. Throughout the day, there is limited time to socialize with fellow campers or employees (unless of course, you’re a Picker) but making time for a quick “How’s it going?” will help you maintain your sanity after hours and hours of repetition and checking your productivity. At the end of your shift, you’ll again notice an extremely long line of campers and employees at each time clock. As they wait for the clock to tick– conversations about ‘work’ and ‘numbers’ fill the air until the exact moment their badges touch the scanner and they exit the building! For first time applicants, the application and hiring process for the Camperforce program can be long, drawn out and filled with delayed responses. From the moment you submit your resume or online application, wheels will naturally begin moving in your head. You’re ready to go! Right? Well, not so fast. When they say Application Process, they really mean it. I would allow at least a month lead time from start to finish, and more likely 2-3 months, but then again, some folks get hired in just a few weeks, so you never really know. There are hundreds of applicants sending in their resumes and only a small on-site staff of HR personnel to sort through them all. Give them some time and just plan on waiting a few days between emails and sometimes even up to a week in-between step. They do an amazing job of getting pretty much everyone who wants to work placed in a position! Fill out the online application on the Amazon Camperforce website. Provide proof of education (transcripts/diploma/degree). You must be a High School Graduate or equivalent. Start Date Given, based on the date you stated you are available. Pre-Employment Paper Work: Forms, needing to be completed prior to your start date. Orientation: Orientation consists of a few hours of Amazon policies and protocols and can be followed by a few hours of training inside the fulfillment center, so wear sneakers! Even if this is your first time, you really do need to know what to expect. You should know what you’re signing up for. Reading every review available will give you information, both good and bad. Just try to keep an open mind and pull from each personal story whatever information is given about the job, the available positions, the workload, the schedules, typical days, location information, community details and the expectations for Camperforce Associates. Take notes on what you’ve gathered and transform these notes into questions. Once you’re called for your phone interview, make sure to refer to your questions for the information you need to know. You can also bring up any unanswered questions at orientation or in a quick email to the HR Staff at the site you’ve decided is best for you. The first year I did Camperforce, I really did have a horrible time. I dreaded waking up at 5 a.m. every day to go to a job I chose, only to realize I didn’t like it. I had no idea what working in a warehouse was like. I had never even seen a conveyor system and barely knew what a tote was. As I looked around at all the smiling campers having a great time, I couldn’t figure out what I had done wrong! Then it hit me – this wasn’t what I signed up for. I signed up to fill customer orders in a fulfillment center. This was not what I had in mind! If you think about my first experience, you’ve probably already noticed – this wasn’t Amazon’s fault. It was actually my own. I hadn’t asked many questions when I agreed to take the position. I was excited and let that excitement overtake my rationale to ask any probing questions. I had absolutely no warehouse experience, but I never once asked what a typical day inside the fulfillment center would entail. Going into this job with the notion that you’ll just “wing it,” is the worst mistake a Workamper could make. Showing up to a campground to work in the store or maybe reservations for the summer may be something to “just wing.” However, signing up to work at Amazon during their Peak Season, when millions of holiday orders are being pumped out at the very last minute, is something you should prepare for. When I left Camperforce in 2013, I swore up and down, I would never return. Then after about a year, I started thinking…maybe I should give it another chance. After all, my horrible experience was largely the effect of my own lack of preparation. If I knew what to expect, I could have prepared. And if I prepared, I would’ve had a really great time just like the other Workampers. Working in a warehouse is mentally and physically draining, so preparing for your job with the Camperforce program will require exercise prior to your arrival. In the weeks and months prior to your start date, I recommend you slowly increase your physical activity level and try to walk as much and as often as possible. Training your body for long periods of movement and even just standing for extended periods of time will help you adjust easier to life inside the fulfillment center. In addition to physical labor, mental stamina will also be a major factor since employee safety is such a major concern. There are procedures and required protocols for just about every action you make and every job you will perform. You need to be constantly aware of your surroundings, as well as your own actions to make sure you’re upholding the high level of safety Amazon expects at each of its locations. Preparing yourself both mentally and physically will make transitioning into your new role a whole lot smoother. There are three main positions that Amazon has been known to hire Workampers for over the years. These positions are responsible for, as Amazon Camperforce Representatives say, “Getting the right product, into the right box and shipped to the right customer, every time!” These positions are known as pick, pack and stow. Let’s take a look! Stow: (v) to put into a place for storage. Ex.) Employees will stow merchandise into their assigned bins within the fulfillment center. When merchandise is received in the fulfillment center, the associates in the Stowing Department have the job of making sure it reaches the shelves not only in a timely manner, but also with the correct labels and into the correct bin so that Pickers can retrieve the items with relative ease. Stowers typically walk between 5-8 miles per day. Pick: (v) to choose from a group. Ex.) Make sure to pick the exact item, as described on your scanner to avoid mistakes. After products have been stowed properly, Pickers receive bin locations on their scanners, report to that location, and ultimately retrieve the correct product with 100% accuracy. The Picking Department is the largest department, involves the most walking (ranging between 8-12 miles per day) and makes up the majority of available jobs for Camperforce. Pack: (v) to put into or arrange compactly. Ex.) Pack your items securely by using cello to fill your boxes before applying the label. The Packing Department waits for the filled totes to arrive at their stations on conveyor belts. They then sort and pack the items into boxes to fulfill specific customer orders. Packing requires less walking than the above two departments, but physical activity is still required. 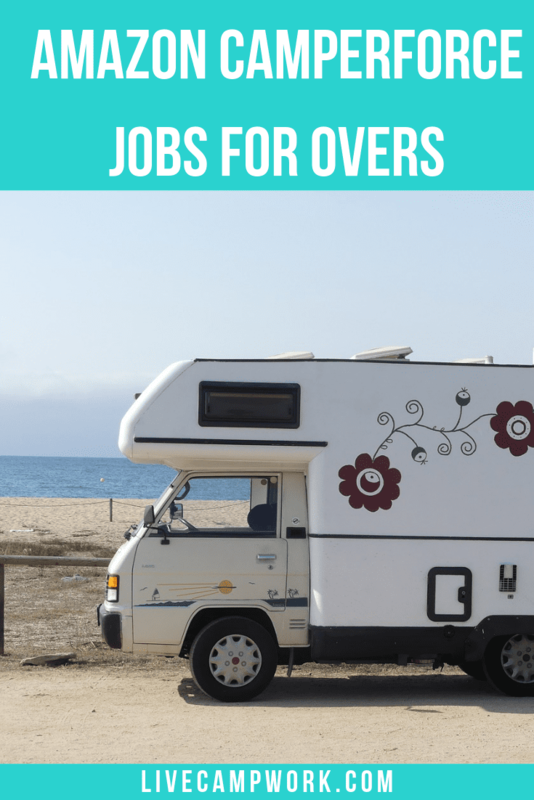 At the close of the traditional camping season, many RVers find themselves in search of a quick gig before heading south or west for the winter. Keeping everything, we’ve already discussed in mind, I consider working for Camperforce to be a great option for many Workampers including singles, couples, and even families. Amazon does a great job at accommodating all types of travelers, and with several positions, locations and schedules available, there’s sure to be something that will suit your needs. Who: Just about anyone and everyone can work the Camperforce program. People of all ages and backgrounds in all different rigs, campers and RVs. If you’re relatively healthy, over the age of 18, able to pass a drug screening and background test and you have a ‘recreation vehicle’, you’ll probably be hired. Check the website for exact details. What: Camperforce is all about working in one of the nation’s largest online retailer’s warehouses. Amazon calls them fulfillment centers, but in an attempt to clarify, I’ll make it clear– you will be working in an extremely large warehouse (possibly the size of a small village) with all the pros and cons that it entails. Where: Camperforce is available at select fulfillment centers throughout the US. In 2015 there were four centers recruiting for the Peak season. Jeffersonville, IN, Campbellsville, KY, Murfreesboro, TN or Haslet, TX. Last time I spoke with a Camperforce representative, they were actively hiring for 6 locations all on the east coast. Check online for specific locations and to apply for these positions. When: Typically, the Camperforce season starts sometime in early to mid-August running through Thanksgiving ending right before Christmas. Recently, the Camperforce program expanded their locations and the dates of the program, allowing for not only longer employment if desired, but also a range of dates and the ability to work at multiple sites back to back. Why: Holiday orders of course! Camperforce is the brainchild that allows Amazon to keep up with supply and demand when it comes to pumping out millions of orders, usually in two days or less, while guaranteeing product accuracy and on time delivery. How: An RV is your ticket to Camperforce. The program was designed for RVers looking for temporary employment while traveling in the United States. While campers come in all shapes and sizes, the bottom line is having one. Amazon Camperforce is currently paying $15 per hour for every hour worked at multiple locations on the East coast. They’ve changed the program up a bit to now include more opportunities at about 6 locations and the option to work after the Peak season- during things like customer returns. With that base number in mind, a single worker who works 40 hours a week can expect to be paid about $600 before taxes. Couples would be around $1200 weekly before taxes. Once you start adding up the overtime you checks will really make you smile, as adding about $225 for every 10 hours of OT can really increase your travel budget for later down the road. While the program is open to hiring applicants of all ages and physical strengths, it is wise not to overestimate your own capabilities. These jobs are all very physical. Walking, standing for long periods, as well as lifting, bending and using multiple sets of stairs is required constantly throughout the day. Know your limits and make sure the job you sign up for is at a comfortable level within your physical ability.